The zany animal protagonists of "Madagascar 3" head into the waters off Monaco. Bring your own project to work on, meet new people, try a new medium or just take a little time to get creative. Supplies are available on a first-come, first-serve basis. This event is free and potluck style. Bring your favorite pink, red or white treat! When: Wednesday, Feb. 13, 5-7 p.m. It's Inconceivable! See a popular fairy tale comedy under the stars on a giant inflatable solar cinema screen. Remember to bring your own seating for the event. Where: University of Arizona, 1657 E. Helen St. When: Friday, Feb. 15, 8-9:50 p.m.
Visit and see demonstrations, exhibits and hands-on experiments. This event encourages kids and parents to explore STEM and how to use it in our daily lives. When: Saturday, Feb. 16, 10 a.m. to 2 p.m. Cost: Museum admission will be free all day, from 10 a.m. to 5 p.m.
Have some fun with some New Orleans dixieland jazz at the Oro Valley Concert Series. This live music series supports local musicians with the opportunity to perform monthly in the community’s largest shopping center. Remember to bring your own chairs. When: Thursday, Feb. 14, 6-7:30 p.m.
Keep your life in balance with classes held weekly throughout the month. Beginner-friendly Hatha style yoga will be practiced. Classes are for everyone and are limited to 15 participants. Where: Central Summit Hut, 5251 E. Speedway Blvd. When: Friday, Feb. 15, 9-10:30 a.m. Cost: Free, first 15 registered. Living Streets Alliance will lead a Family Bike Ride from Himmel Park to the Jewish Community Center so that families can enjoy a little extra special time together and get a little exercise on their way to the This Is Tucson Summer Camp Fair. The ride is all-ages, family-friendly, no friend left behind — to and from the School and Camp Fair. Where: The ride will leave and return to the north parking lot of Himmel Park, off East First Street, behind the Himmel Park Library. When: Sunday, Feb. 17. The ride will depart at 11 a.m., arriving at the Camp Fair between 11:30-11:45, and will regroup for the ride back at 2 p.m., arriving back at the parking lot between 2:30-2:45pm. Find the perfect summer camp for your family at this one-stop event that brings together Tucson's best summer camp organizations with parents and kids. When: Sunday, Feb. 17, 11 a.m. to 4 p.m.
Get up early to grab a spot for the best rodeo parade in the country. 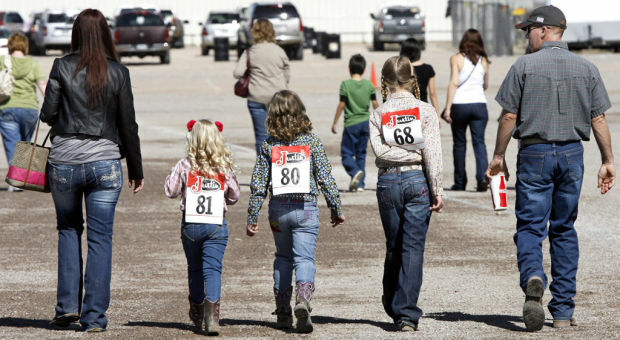 The route begins on Ajo Highway and ends at the Tucson Rodeo Grounds. Where: Tucson Rodeo Parade and Museum 4823 S 6th Ave. Cost: Free except for grand-stand seating. The Fox Tucson Theatre is teaming up with USAF Commanders Jazz Ensemble. During the concert you will hear the music of jazz legends Duke Ellington, Woody Herman and Count Basie. Where: Fox Tucson Theatre, 17 W. Congress St. When: Tuesday, Feb. 27, 7:30 p.m.
See what Alex, Gloria, Melman and Marty are up to at the park. The screening will take place outdoors on hippie hill at Himmel Park. Bring your own seating and food trucks will be available onsite. When: Friday, Feb. 22, 6-7:45 p.m.
Join a singalong with Mr. Nature and friends and then stroll through Mildred & Dildred's whimsical toy shop.